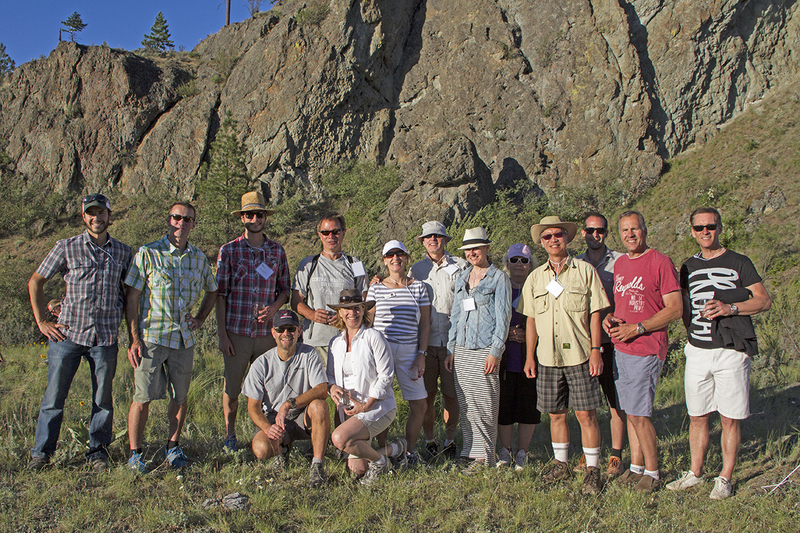 Here’s a group of winemakers from Okanagan Falls. We’re gearing up now for another round of live blogging, red wines this time. You know the drill, 10 wines in an hour. We write about them as the rep describes each one.This I promise you keeps you on your toes. They’re heading to the tables. 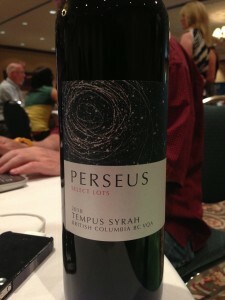 Looks like Perseus Winery will kick things off at our table. Tasting room is in downtown Penticton. They poured the 2010 Tempus Syrah with a little Viognier added creating co-pigmentation. $28.99. Grapes are sourced from a bench near Oliver. Beautiful mouthfeel, the Viognier rounds it out nicely. Good start to round two. Approximately 400 case total production. D’Angelo Estate Winery from the Naramata Bench. Bordeaux blend called Sette Coppa 2007 Reserve. 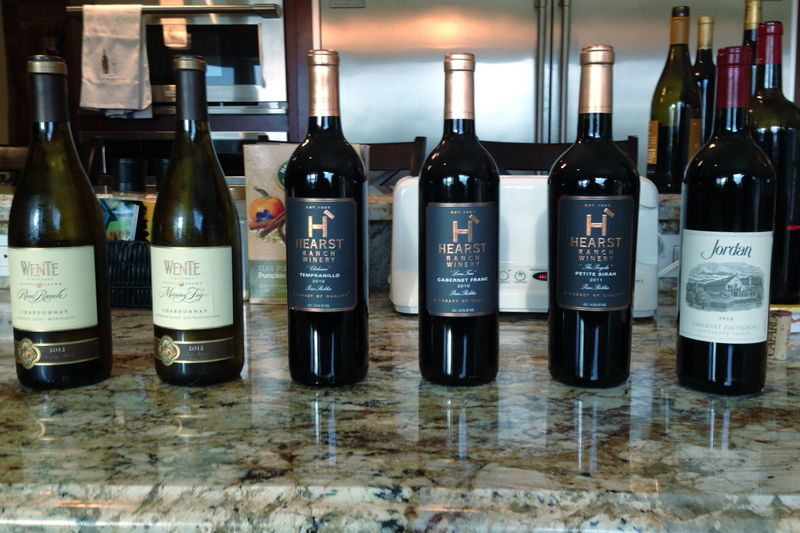 Love the nose, wine picked up a gold medal in the 2012 All Canadian Wine Championships. Lots of tannins, time should soften it. Open for visitors May through October. Retails for $24.90. Beautiful ruby color, nice balance, solid finish. I think it’s priced right. It’s time for wine number three, Mt. Boucherie 2009 Zinfandel, one of three Zins in the Okanagan. Bright fruit, great nose, peppery on the palate. Sells for $35. Pricey compared to California Zins, but I like this wine. 100% family owned and and grown fruit. 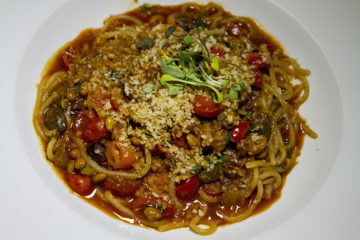 Suggested pairings lasagna, chicken or lamb. 2006 Summerhill Pyramid Winery ’06 Cab Franc. 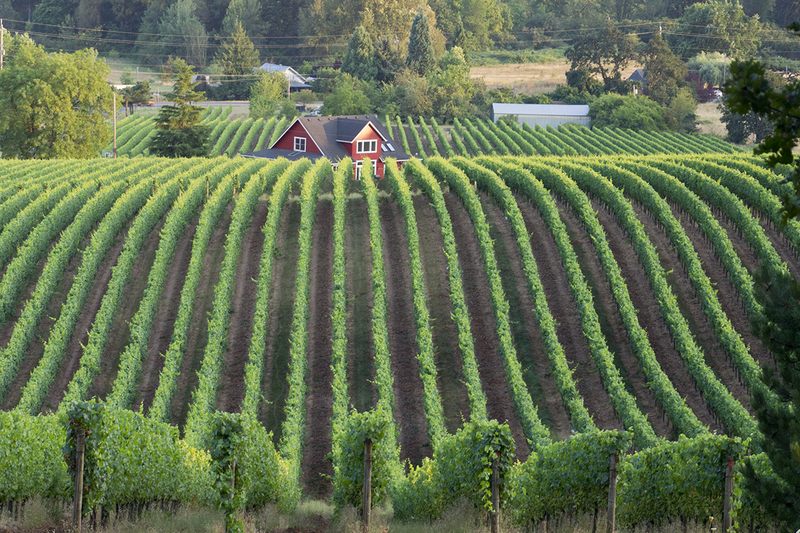 BC’s first certified organic winery. 150 – 200 cases per year. The wines are aged inside a pyramid. 12.1% alcohol, nice and soft Cab Franc. The pyramid enhances good flavors, accentuates bad ones. Wines stay in pyramid for 30 days. $29.95 a good value. Here come the women from Hillside Winery in Naramata. Winery also has a bistro. 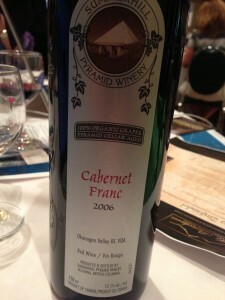 2009 Cabernet Franc. 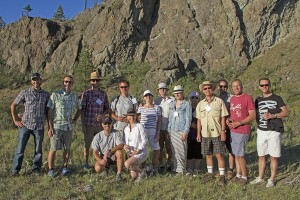 Opened in 1984, some of the oldest grapes in the Okanagan. $24.99 per bottle. Good ripe fruit, pretty color. 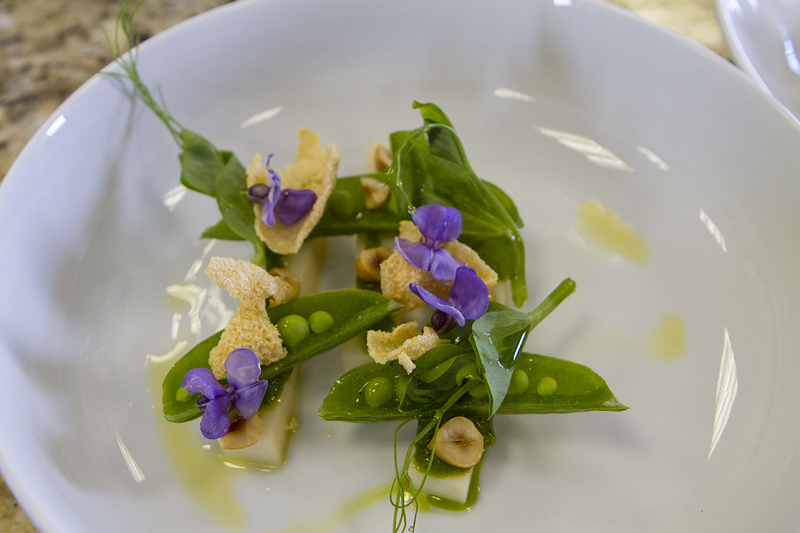 Tasting room is open April – December. 700 cases of this wine, 10,000 case total production. “Are you ready for some Meritage?” was the question posed. 2009 McWatters Collection in the business since 1968. 44% Cabernet Sauvignon, 32% Merlot, balance Cabernet Franc. Vines planted in 1993. Really tastes like a Meritage. Again, I’m impressed. Well balanced, fruit shines through, sells for $30. First Meritage outside of the U.S. 500 cases produced. I love the name right off the bat. Laughing Stock Vineyards 2010 Portfolio Bordeaux blend. Winery is 10 years old. Called Laughing Stock because they gave up their day jobs to start a winery. Deep color, good nose, dances on the palate. 19 month in French oak. “Fun name, serious wine.” Every bottle shows its harvest date. $42. Lovely wine. Bench 1775 2011 Cabernet Merlot. 80%Merlot, 20% Cab Sauv. 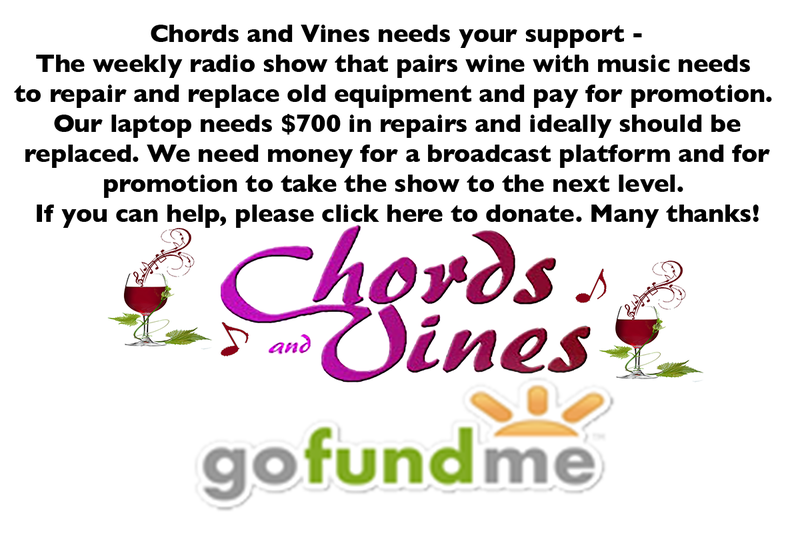 Vineyards are in Oliver, Merlot vines are six years old, Cab vines are eight. One of three wineries in the world with privare beach access. Shows nicely for a wine this young and has potential to age gracefully. $22.90. 1163 cases produced. 2009 Stewart Family Reserve Pinot Noir from Quails’ Gate. Gold medal winner in Mondial de Pinot Noir in Switzerland. Beautiful pale color. Dijon clone. Don’t release a reserve every year, it has to be worthy. 2000 6 pack cases released. Fermented with indigenous yeast. No doubt this is a Pinot on the nose, the palate and finish. 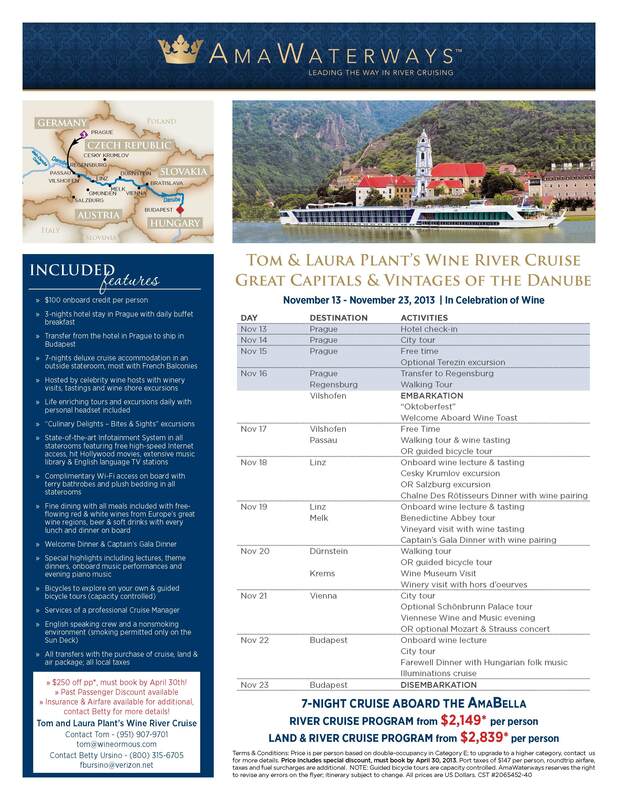 $45 available currently only to wine club members. Aged in French oak, 40% new. 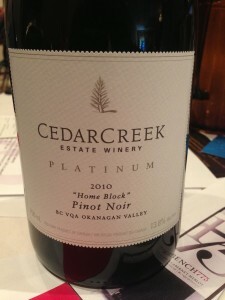 10th and final round… Cedar Creek 2010 Platinum “Home Block” Pinot Noir. 16 months in 100% French oak. 559 cases produced. Much darker Pinot. $39.95. Black licorice, cherry notes. I love Pinot and this is nice. Good ending to a fun afternoon.